Harvard men’s soccer opens Ivy League play Saturday with a home game against rival Yale. 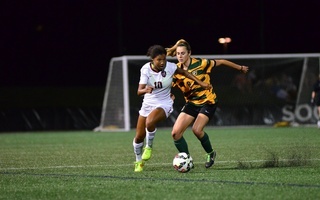 The Crimson will look to beat the Bulldogs for a second consecutive season, having rallied from a goal down to score two goals in the final eight minutes of last season’s game. The match kicks off at 4:00 at Jordan Field. Harvard (2-5, 0-0 Ivy League) has faced a number of difficult opponents so far this season, falling to three ranked teams by a combined nine goals. The tough stretch of games came during a time in which Harvard was still getting accustomed to two new assistant coaches — Mike Fucito ’08 and Francesco D’Agostino — and a new formation. 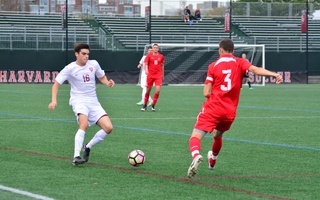 But the Crimson is coming into Ivy League play on a high after it beat familiar opponent Boston University, 2-1, in overtime last Wednesday on junior Taner Dogan’s second goal of the season. Yale (4-2-1, 0-0) enters the game on a three game winning streak, with the victories coming over Bryant, George Mason, and Fairleigh Dickinson. But the Bulldogs’ most impressive result of the season thus far was a 2-2 draw against Big Ten stalwart and No. 5 ranked — according to the United Soccer Coaches poll — Michigan State. Harvard will be looking to prove that its last-place finish in the Ivy League last year, their first such finish since 2012, was no more than a fluke. With Dartmouth, winners or sharers of four straight Ivy League championships, struggling to a 1-4-2 start to the season, both the Crimson and Yale will feel that the opportunity is there to challenge favored Columbia and Cornell for the Ivy League championship. Additionally, Harvard has had 10 days to prepare for this game, a welcome change from the congested schedule the Crimson had earlier in the season. “It’s kind of nice to get a full week of training and work on some things before the game,” Dogan said. Harvard must shore up its defense in order to successfully defend its home turf Saturday, because the Bulldogs have scored nine goals in their last four games. Yale is led up front by impressive freshman forward Paolo Carroll, who has scored goals in three straight games and has four goals and three assists on the season despite coming off the bench in the first two games. The Crimson has given up 19 goals in its first seven games, more than any other Ivy League team. 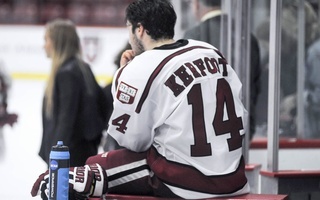 But head coach Pieter Lehrer and the team will be encouraged by the fact that just four of those goals allowed have come in the Crimson’s three home games, a sign that perhaps Harvard is more defensively solid on its home turf. The Crimson will hope that the St. Louis native’s overtime winner against Boston University can get its offense rolling. 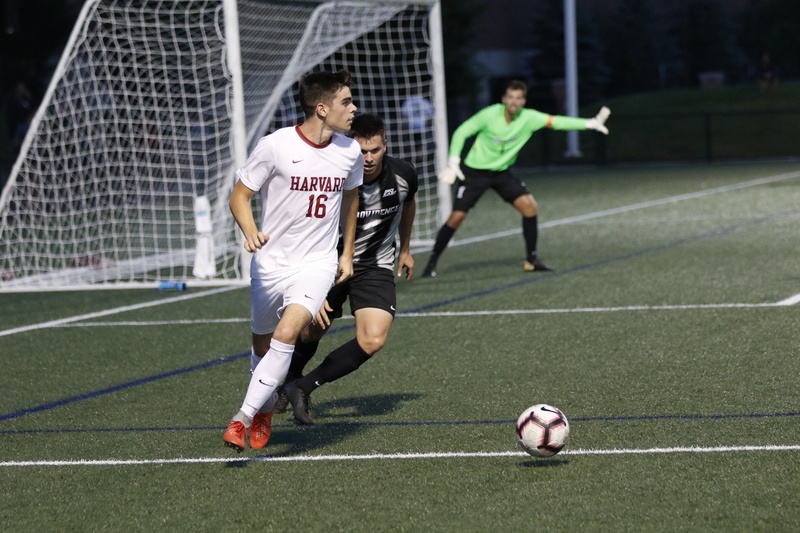 Harvard has tallied just eight goals in seven games, with tallies coming from six different players, led by two each from Dogan and senior forward Cesar Farias Jr. The Crimson will have to rely on that diversity of attacking threats against a Yale team that has held its last three opponents to one total goal and its last two to 11 combined shots. The streaking Bulldogs should serve as a good measuring stick for Harvard after the Crimson’s tough and hectic start to the season. Hjermstad is confident about Harvard’s chances. Correction: A previous version of this article listed the location of Saturday's game as Ohiri Field. In fact, it takes place at Jordan Field. Why The Wait for the Ancient Eight? Out of Conference Games: Good for the Ancient Eight? Loss, win, win, loss, win. So reads the Harvard football team’s schedule from the season opener against Rhode Island to last week’s victory over Lafayette. Thus far, Harvard has not proven itself as the top Ivy League contender, nor has it fallen by the wayside as a pretender. Fittingly, it is nearly impossible to gauge the Ivy League as a whole—upsets have abounded, and it seems like with every passing week predictions become harder and harder to make.